I stayed home from work today with a queasy stomach, so I was sitting on the couch when my husband came in with the mail. Along with a quarterly statement from my 403b and a plea from the public radio station for financial support, there was a big padded envelope. "Did you order more fabric?" he asked, knowing that it's not the most unlikely thing ever to arrive at our house in a padded envelope. "I don't think so," I replied. "Well, you got something from the Alliance for American Quilts." I had just joined the Alliance on Thursday (so that I could get a discount on admission to Quilters Take Manhattan in the fall), so I was surprised to already be getting something from them. 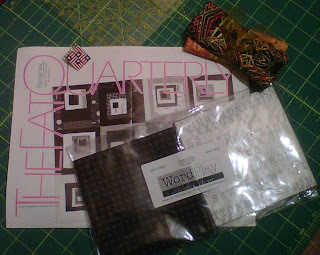 What a pleasant surprise to find an AAQ pin, a couple of gold-toned fat quarters, and a packet of "Word Play" fabrics from Benartex. (I love all things wordy, so this was a excellent gift for me.) Since I absolutely didn't expect anything from having joined, it was a really wonderful bonus.